If you’re already using safety restraints for yourself and your kids for every trip, good for you! But, if you’re pregnant, a growing belly can be an obstacle when trying to fasten your seat belt. How would you put it on? 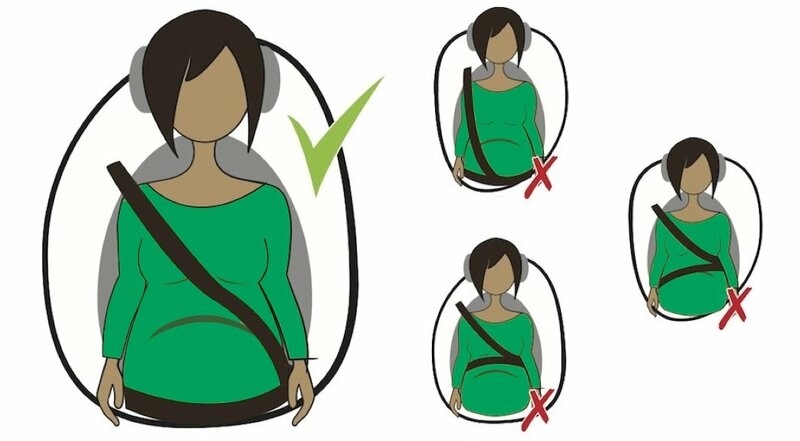 Many moms just pull the lap belt over their bellies, thinking that it will be safest for securing their baby in a crash. In fact, wearing a seat belt like that could risk your baby’s life. Premature labor – Defined as occurring before 37 weeks gestation. Placental abruption – When the placenta detaches from the uterine wall before labor. This is extremely dangerous, since the placenta is the only way your baby gets oxygen before birth. Miscarriage – Death of the baby in utero before 20 weeks gestation. Stillbirth – Death of the baby in utero after 20 weeks gestation. Any of these things can happen apart from car crashes, but the leading cause of trauma to unborn babies is from car crashes. Though crash testing for pregnant women is still being perfected, some studies are showing that the placement of the seat belt can play a big role in how much damage is done to an unborn baby. If worn properly, your seat belt acts as your baby’s first car seat. According to a 2008 study, pregnant moms who wore seat belts were 4.5 times more likely to have good outcomes for their babies than moms who didn’t wear one. But just like car seats, if you don’t use a seat belt correctly, it’s not going to protect the way it should. Make sure the shoulder strap goes between your breasts, across your shoulder, and off to one side of your belly. Do NOT put it under your arm. The lap belt should lie UNDER your belly, over your hips. Never put the lap belt across your belly. Adjust the length of the shoulder strap if necessary to ensure the belt fits the way it should. Both lap and shoulder belts should fit snugly, but not uncomfortably tight. 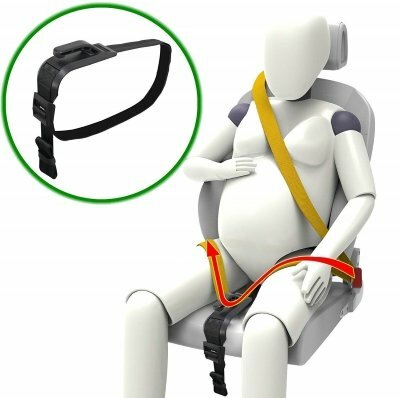 Crash testing has shown that placing the lap belt as low as possible under a pregnant belly causes the least amount of uterine compression during a car accident. It’s this compression force and resulting pressure inside the womb that can cause serious complications such as those listed above. In fact, it’s safest to wear your seat belt like this at all times for both kids and adults. When the lap belt lies across the abdomen, your most vulnerable organs (liver, kidneys, intestines, spleen, etc) absorb the crash forces. Placing it over your hips means the strong pelvic bones will absorb the forces instead. What else can you do to stay safe in the car while pregnant? There are a few other things you can implement to keep you and your baby bump safer in the car. Don’t drive more than 5 – 6 hours a day. For one, it’s tiring, so your risk of falling asleep at the wheel increases the longer you drive. Secondly, blood clots are more common during pregnancy due to decreased blood flow to the legs. Sitting for too long in a car can decrease blood flow even more and further increase the risk of blood clots. Sit as far away as possible from the airbag. Move your seat as far back as you can, but make sure you’re still able to fully operate the gas, brake and clutch. However, don’t worry about this too much. One study has shown that airbags don’t pose a risk to unborn babies. Try a maternity seat belt adjuster such as this one from Zuwit. It fits on the seat bottom between your legs and attaches to the middle of your lap belt to help keep it off your belly. It’s also good for after C-sections or other abdominal surgeries. Avoid any seat belt adjuster that keeps the lap belt over the belly, even those with pillows. ❮ Is the UPPAbaby MESA infant car seat worth its high-end price tag? Read our 2019 review to find out.